verso inscribed in pencil: "Father Lacombe persuades Chief Crowfoot and the Blackfeet to allow the railway to be built across their Reserve". The coming of the railroad in to the prairie country stirred the minds of the Indians of the West with uneasy forebodings. They saw in the surveyors with their instruments, measuring out the lands, magicians of evil omen, putting a "bad medicine" upon the country and its people. As they watched the long rails creeping resistlessly across the plains, the hordes of labourers at work, the endless loads of supplies, the iron monsters that followed, bellowing smoke and flame, their fears increased, and they began to realize more keenly the approach of the white flood which was to overwhelm them. Already the buffalo had gone, and isolated settlers had planted themselves here and there on the lands over which for ages the red man had roamed. The building of the railroad showed them clearly that the wandering freedom of their old life was over. They watched its steady advance with sullen discontent, which sometimes broke into passionate protest, and on a few occasions into active opposition. Steadily the iron road crept westward till it reached the Blackfoot country. Here the survey lines had been run through a portion of the Reserve allotted to this warlike tribe, some sixty miles east of Calgary. It was the intention of the government to compensate the Indians for the land taken for the railway; but through some departmental carelessness, at the time only too common when Western affairs were concerned, no word of this had been sent to them. When the labourers began to lay the rails on the lands of the Reserve, a crowd of angry Indians met them and tore up the track. 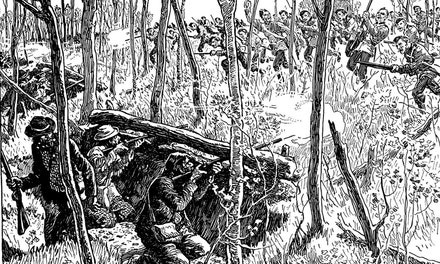 Their great chief, Crowfoot, forbade the railway men to enter upon their lands, and bloodshed was threatened if they persisted. This meant serious trouble, for the Blackfoot confederacy was the most numerous and formidable body of Indians in the North-West. One man there was who might be able to allay their excitement and hostility. It was Father Albert Lacombe, the missionary, who years ago had earned the name of "The Man with the Good Heart" among the Blackfeet by his devoted services during the epidemics of smallpox that ravaged their camps. He was the friend of every tribe, at home in every lodge, a peace-maker, a man upon whose word the Indians relied with absolute confidence. To him at Calgary the railway builders sent word of the trouble. He rode for the Blackfoot Reserve at once. There he found the Indians resolutely confronting the labourers, determined that not a rail should be laid across their lands. 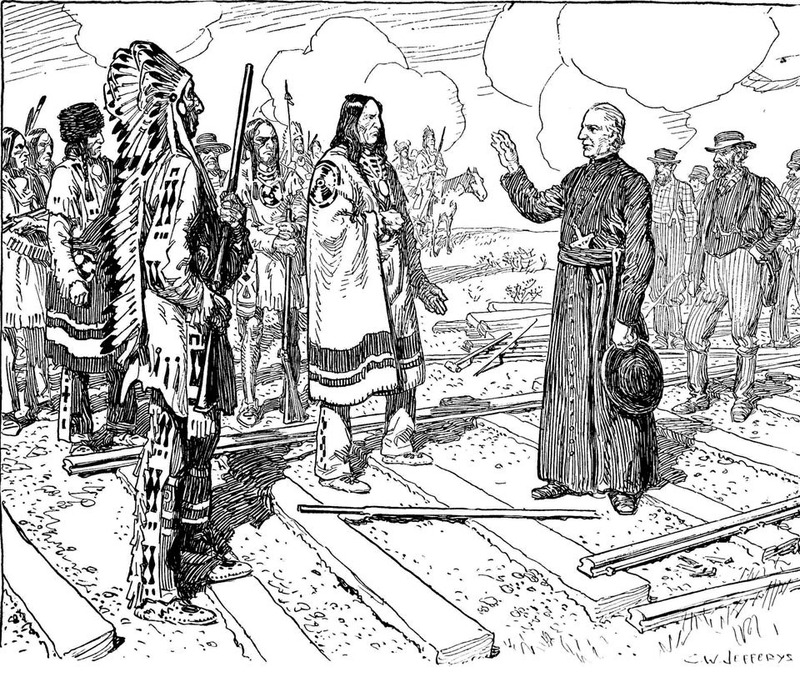 Father Lacombe gave his word of honour that the government would give them other lands in payment for the right-of-way, and won their consent to allow the tracks to be laid through the Reserve. It was but one of the many errands of peace that he undertook during more than fifty years' missionary service among the Indians, the Metis, the railroad labourers and the settlers. To the influence of the missionaries, Catholic and Protestant alike, is due very largely the peaceful settlement of the Canadian West, and among them none rendered more extensive and valuable service than Father Lacombe. For the Indian, in particular, he had an intelligent sympathy and a ready intuition, which perhaps was quickened by the slight strain of Indian blood which he inherited. 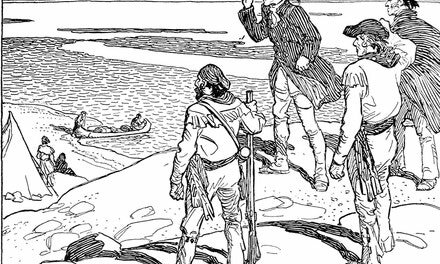 In 1695, a party of Algonquin warriors captured the eldest daughter of a habitant farmer at St. Sulpice, on the St. Lawrence below Montreal, and carried her off to Sault Ste. Marie, where she was forced to become the wife of one of the Indian raiders. Five years later she managed to escape with her two infant children, when a party of traders visited the Sault, and she was recognized by an uncle who was among them. She was restored to her family, and became the ancestor of Father Lacombe. Close rooted to the soil, the family clung to the home by the St. Lawrence, and it was on the same farm from which the little French girl had been carried away that the great Indian missionary was born in 1827. Eighty nine years later he died in the home for orphans and the aged poor which he had established at Midnapore in Alberta, after a lifetime full of adventure and of work for the welfare of his fellow men, red and white.